Got the rear heater working today [good as the fan for the front one don't work]. Getting a quote for the paintwork on saturday. 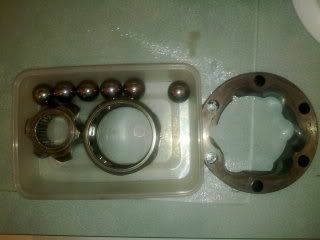 And hopefully jed will work his magic over the weekend and get my diff locks unstuck. Once i've got a price for the paint i'll purchase my Grabber AT's. Got A picture Nigel, Did you go the Bridgestone route? twiggy wrote: Got A picture Nigel, Did you go the Bridgestone route? 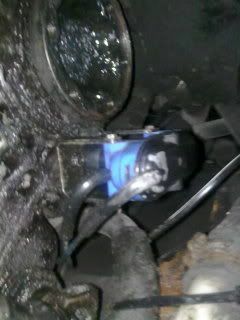 Removed screw in sensor from front locker and filled with plus gas, will leave to soak overnight. Rear locker is now moving through half its range, left to soak again. Bloody hell that looks better, messy isnt it? 1, The rear difflock pin is now moving but still abit to stiff for the actuator to push it in and out on its own. 2, The new CV boot at the back is fitted and the CV serviced. 3, Oh yeh... and after a few tests on the VC the conclusion is (drum roll) It defiantly fails open under load. Oh yeh... and after a few tests on the VC the conclusion is (drum roll) It defiantly fails open under load. 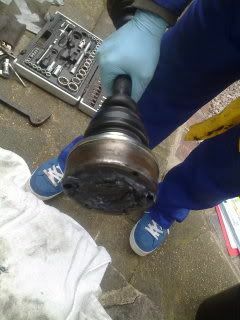 Now just to drop the inner CV joint and carry on freeing off the rear diff lock. Front locker puzzles me, how can you free it off if there is no way of pulling it back out, once you knock it in. Also a quick question, when freeing off rear locker how far in should it be able to go? Should the hole to hold actuator on go right down to the gearbox? Mine goes in/out quite nicely, just not too sure how far it should be going in. rear pin should go most of the way in, certainly past the actuator securing pin. if the pin isn`t flush the plunger can catch and stop it enguaging. top tip from aiden that. Yes.. You need to rotate until it is all online inside the diff for to engage. Every 1/6th of a turn or something like that can't remember the exact amount.. If you chaps are still wolfing on it tomorrow I might swing by for a cuppa.. Worried and confused, what is happening in this picture? Have deduced that Superman in his normal blue regalia is holding part of Lloydy's van but what is the yellow bit???? I suspect they might be getting some outside help in.